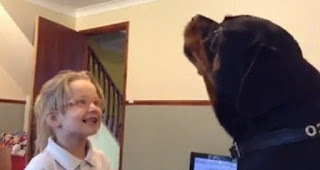 Little Girl and a Rottweiler Dog Love Singing Together ! Most kids like to sing for anyone. But a video of a little girl who serenades her pet rottweiler with ‘Twinkle, Twinkle Little Star’ takes singing to another level, is just amazing. In this video a Rottweiler dog is seen singing along with the girl. The video uploaded to YouTube originally by youtube user Dan Cena, shows Dan Cena’s young daughter who sings nursery rhymes with the family pet, a big Rottweiler dog. The girl sings two popular children's songs “Baa, Baa, Black Sheep” and “Twinkle Twinkle Little Star.” and from the beginning the Rottweiler named Coco sings along with her. The Rottweiler barks and howls along with the girl. This amazing video shows the true nature of Rottweiler dogs, it shows that Rottweilers can be awesome dogs for families with kids.